In reverse order of version numbers, so the most recent changes come first. Version numbers are dates of uploading (yy.mm.dd). 19.4.16: Bug fixed in which using check boxes while inside a building caused brief view of external scene. 19.4.10: Map scroll and kind are now selected from drop-down lists. Scenes with longer range selected should now draw faster. 19.4.6: Fixed bug which was preventing entry to doors on buildings (since 19.3.15). 19.4.1: Two moving objects. When they meet they transform into something particularly appropriate for this terrain and the way it is drawn on tiles, as described by Lewis Carroll in 1871. 19.3.29: First autonomously moving object added. It may be seen on the track by explorers. 19.3.15: Track added to legend box. Internal improvements. 19.2.24: Bearing drift no longer occurs if standing on a paved area (town or track). Every mine shaft now has an escape ladder (previous restriction removed). 19.2.21: Helicopters now stay where you land them rather than flying back to their starting position. They can be reused from where they landed. 19.2.19: There are some tracks in the starting part of the map, linking some built-up areas. They are shown as dashed black lines on the map and it is amusing to follow them both on the ground and from a helicopter. Only those in the explorer role will see the tracks. Orienting the map works but turning through 90° does not. 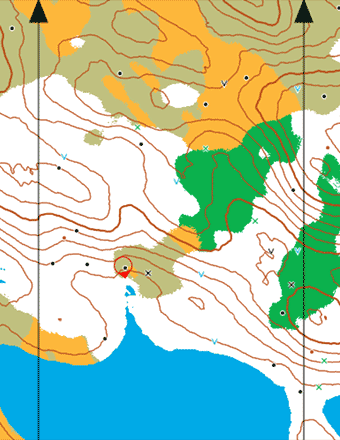 Now that we have map orienting, I am thinking about removing the 90° map turns anyway. I have done statistical timing tests and the tracks do not significantly slow down map or scene drawing. For programmers: this demonstrates that objects can be positioned on the ground (using an object, ie very efficient hash table, in terrain.js) but goes against the automatic terrain generation principle. But then, tracks in the real world have to be made by people (or animals)! You are unlikely to start with rain but the others may be useful. Each parameter that is present must have the value y to switch the relevant effect on. 19.1.14: Explorers can find some encrypted hints where others would see traffic cones. New challenge: crack the code! 19.1.9: Link to map-reading quiz. Other internal improvements users should not notice. 18.12.30: Buildings now have windows (externally). Bug fixed in which doors could sometimes disappear. 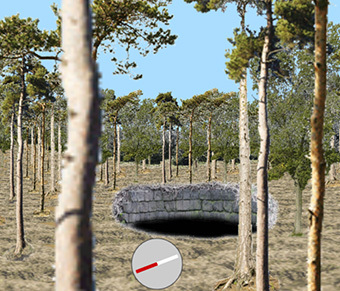 18.12.27: Visible range is now indicated on the map by a dashed red circle (explorers only). 18.12.23: Map display is protected against disruption by keys held down and repeating. The list of ranges available has been modified and the furthest is now 400m (for fast machines). Explorers only: on entering a helicopter it immediately rises 10m. 18.12.18: Inaccuracies in drawing buildings have been fixed by drawing them quite differently (in sections). Vertical scale increased again by 10%. 18.12.14: Start & finish banners improved and they now say which is which. New grass and moor images. 18.12.13: Fog starts at 75% of the horizon distance instead of 50%. Anyone addressing the site with a non-https URL will now automatically see it as https. 18.12.11: Foggy horizon now also applied to orienteering markers and start/finish banners. 18.12.10: Explorers may find helicopters on open ground. 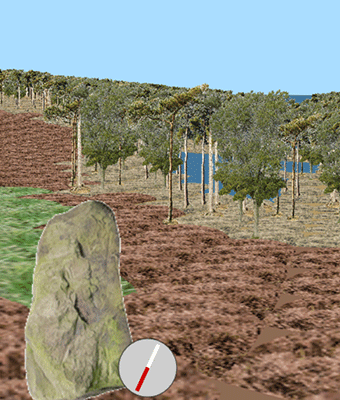 It is possible to board and ascend to get aerial views of the terrain. This gives another way of studying the relationship between map contours and the ground relief. Forward motion and altitude changes are always in steps of 10m. When the helicopter is brought back to ground level it disappears, having flown back to its base. 18.12.2: Independent check-boxes to control effects: detail level, fog and rain. For programmers: how the fogging is done is described in detail here. 18.11.30: Now everything can be hazy at the horizon but only if max detail box is ticked. 18.11.27: Experimenting with making the horizon hazy so that objects do not appear too suddenly. So far only buildings and paving are affected and the result is better for horizon ranges greater than 60m. The j key does not work on paved areas (towns); a message is shown. 18.11.16: The status line for scene drawing now shows how many images were drawn to make the scene (the number of calls to the drawImage method of the 2D context). 18.11.9: There are now things to see inside buildings, including some potentially useful information. 18.11.7: (For non-orienteers.) The treasure chest now has a note in it which tells how to proceed to a further stage, using an interesting feature I discovered on the map near Treasure Island. Doors on all buildings can now be entered if you know their key codes (something for you to work out). Buildings all have interiors to view. Leaving again through the door does not require a code. For those without keyboards: tapping or clicking near the centre of the scene is equivalent to the Enter key. 18.10.30: The vertical scale for drawing scenes has been increased by 20% which makes contour effects more visible. This is possible now that users can scroll the scene up or down. Every building has a 2m wide door on one of its sides, painted in a colour of its own. These doors do not do anything yet. The maximum-detail check box is now switched off whenever the page is refreshed (previously its state did not change, confusingly). When the box is checked a new consequence is that flat roofs are drawn on any buildings which the observer is looking down on. 18.10.25: When viewing the scene it is now possible to look up or down (+ or - keys or click buttons). 18.10.24: Towns now have solid buildings, if rather plain. 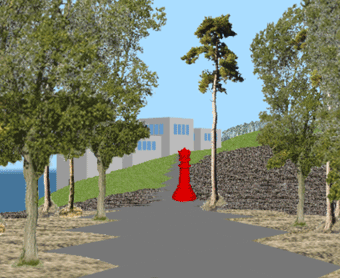 They are each shown on the map and it is necessary to navigate along the paved streets, avoiding the walls. Slightly ragged display and plain walls will be worked on further in due course. 18.10.19: Some speed improvement in scene drawing. New check box for max. detail (avoids distant trees looking like a row of teeth on a comb). 18.7.14: V symbols (mines & ponds) turn with the map. Map no longer recentres as orienteers move. 18.6.26: There is a green door in a wall for explorers to enter and see a different view. There is a way back! Orienteers will not encounter the door, nor be distracted by other things aimed at explorers. 1986: "Explorer" version for ZX Spectrum, with graphics by Simon Dunstan of RamJam Corporation, published by Electric Dreams. The ground cover is still untidy. It is a compromise to avoid slowing scene drawing too much. I am still thinking about ways to improve this. Need more variety of tree photos (8 types rather than the current 4). 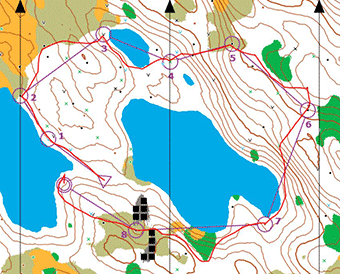 Add profile graphs to the results analysis for orienteers: compare crow-fly profile with that of the route actually taken. Give some statistics of height gain and loss (energy efficiency). The treasure hunt will continue to have further stages. Map movement could be speeded up by sliding the part that remains visible and only drawing from scratch the newly revealed part. More varied content inside buildings.